I'd been curious about the "no-poo" craze and the Wen shampoo that seemed to be at the forefront. In my quest for mermaid hair, I'm willing to try pretty much anything that promises faster hair growth... but 30 bucks a pop was WAY more than I'm able to spend on hair stuff in my poor college student state. Same basic idea as Wen - its a cleansing conditioner rather than shampoo, so it doesn't have all the harsh sulfates and soaps that make your hair lather and tangle. 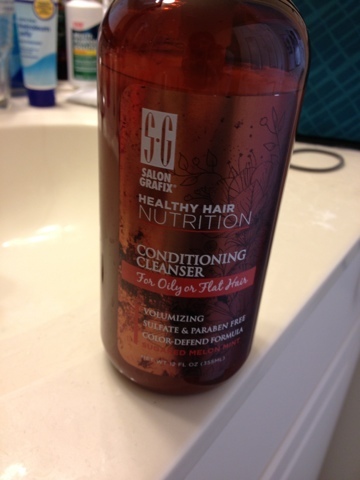 This stuff takes the place of shampoo AND conditioner, and can be used as a leave-in conditioner as well. Pretty nifty. The niftiest part? It's $8.00. So I decided to give it a go. I really like it so far... I have noticed a difference in my hair, it seems much softer and more manageable within the 2 weeks I've been using it. My only complaint is that it doesn't seem to clean quite as well as regular shampoos - my bangs get limp by the end of the day. But there's always dry shampoo to the rescue! All in all, this is definitely worth a try, especially if you have damaged hair. And since it's shampoo and conditioner, it actually saves you money too. There's a brand called Ren that makes a cleansing conditioner as well... I haven't tried it but it's the same deal for about $10. So there are lots of options that don't cost an arm and a leg!